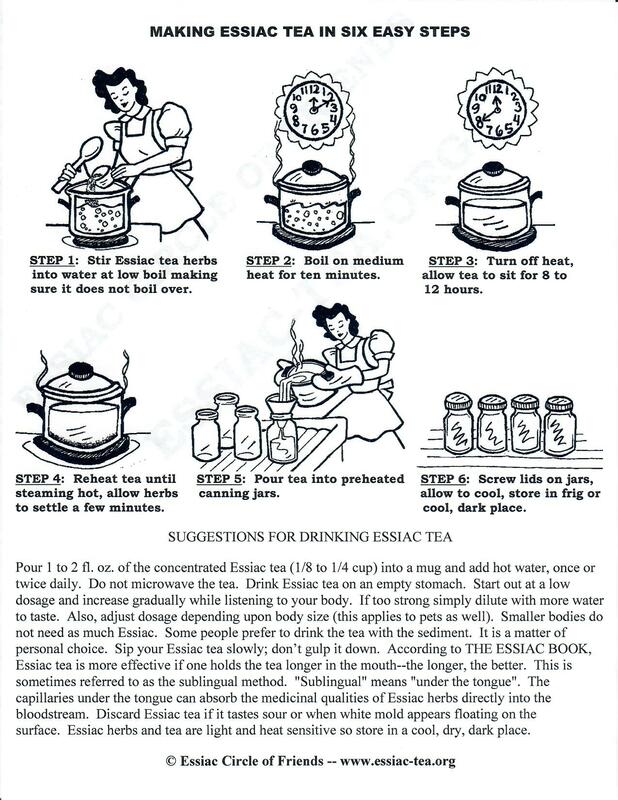 The following Essiac tea instructions have been simplified as much as possible to save time and to make it easier for people new to Essiac to make the tea. The supplies for making Essiac tea can usually be found in your local hardware or grocery store in the canning supplies section. Do not use any aluminum utensils as aluminum can react with Essiac tea. Supplies Needed: Enameled pot, glass pot or stainless steel pot--with lid. Canning jars, lids & rings. Strainer and funnel or a glass measuring cup. See picture tutorial below. The following recipe is for making one gallon of tea using 1/2 cup (2 oz by weight) of Essiac tea herbs. You can make a smaller, two-quart batch by dividing this recipe in half, etc. It is best to make just enough Essiac tea to last about two weeks because Essiac tea is perishable and will eventually spoil in the refrigerator. You can increase the shelf life of Essiac tea by sterilizing all utensils, jars, rings, lids, etc. in a boiling water bath for at least 15 minutes. One can skip the sterilization step to save time and therefore one can make Essiac tea in small batches to drink it up quickly before it spoils. 1. Slowly stir 1/2 cup (2oz) of dried Essiac tea herbs with sheep sorrel roots into one gallon of unchlorinated (filtered) water at low boil, making sure it doesn't boil over. (Optional: Add extra water to compensate for water boiling off and water absorption of herbs. To make a two-quart batch use ¼ cup of herbs; for a one quart batch use 2 tbsp. 2. Boil on low heat (simmer) for 10 minutes making sure it doesn't boil over. The taste is better if simmered instead of a hard boil. A hard boil brings out more of the bitters and would be theoretically more "medicinal". 3. Scrape down the sides of the pot and allow the tea to sit, covered, in a warm place (room temperature) for 8 to 12 hours. Overnight works well. 4. Reheat the tea in the covered pot until steaming hot, but do not boil it twice. If boiled again for too long it may not taste as good. Allow the tea to sit covered and undisturbed for several minutes so that the herbs will settle to the bottom of the pot. 5. Place funnel and strainer on top of preheated canning jars. (If you don’t have a funnel and strainer, you can use a glass measuring cup to pour the tea into the jars.) Carefully pour off the liquid from the pot into the canning jars so as to keep sediment out as much as possible. 6. Screw the lids on, allow to cool and then refrigerate. The sediment can be used for poultices or can be discarded or composted. Some sediment at the bottom of jars is quite usual and acceptable.